For the past twenty years I’ve been studying, researching and teaching storytelling in business. My students over that period of time, many of them graduates of The Story Theater Retreat, have asked for a video course to keep the skills, competencies and techniques they learned from studying with me fresh. Now that course is available in an online learning format. 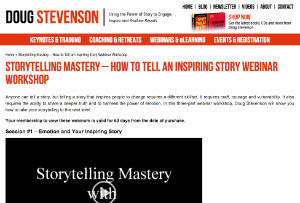 Are you tired of winging it with your stories and getting mixed results? Do you want to change people’s lives, tell better stories, and take your storytelling skills to the next level? Strategic and masterful storytelling is the way. 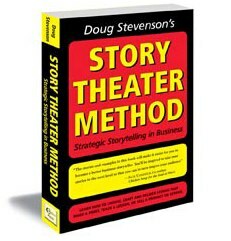 Learn to choose, craft and deliver your stories with The Story Theater Method. This series contains everything you need to turn your stories into amazing stories. You’ll get instant access to the self-paced, online instructional video series, plus bonus summaries and exercises for each video. 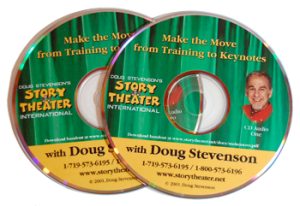 You’ll also get 5 bonus videos of Doug’s stories to use as reference for the skills and techniques you’ll be learning from Doug. 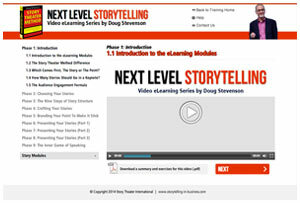 When you get the Next Level Storytelling Video eLearning Series, you are directed to a User Registration page to get instant access to all of the videos and bonuses. You’ll also receive an email to confirm your registration and give you unlimited online access to the videos and worksheets at any time. This book was first released under the title Never Be Boring Again – Make Your Business Presentations Capture Attention, Inspire Action and Produce Results. 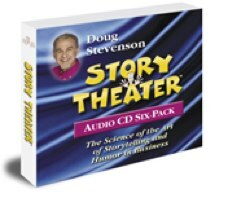 This is the downloadable mp3 version of the Story Theater Six Pack. This comprehensive and practical exploration of storytelling in business will help you to be a better speaker immediately. 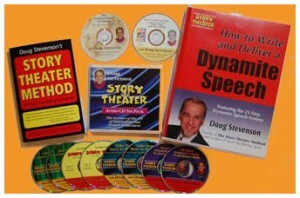 This 6 audio CD or cassette set covers how and why stories work, how to choose, place and develop your stories to make your business and training points; how to craft and structure stories for greater effectiveness; how to add humor and drama to your stories; and how to perform stories. Do you want to be funnier? You’ll learn the secrets of comedy and humor. Do you get nervous? You’ll learn what professionals do to combat the jitters and perform with confidence. This program contains over five hours of detail-rich content, including examples. Very comprehensive – A Coach in a Box. Are you ready to get more laughs, write funny material and be more consistent with your comedy? 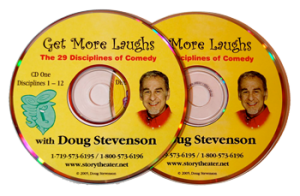 In this 2 CD set, you’ll learn the secrets of physical, vocal and conceptual comedy from a very funny man – Doug Stevenson. In 1967, Doug went to a Bill Cosby concert and came away with a burning desire to understand how to get laughs. He’s been studying comedy as an actor, speaker and storyteller ever since. 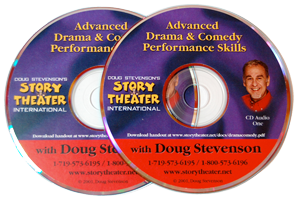 Doug now teaches comedy and drama to seasoned and aspiring speakers, trainers and business professionals through his workshops, Story Theater Retreats and private coaching. Get ready to learn how to Get More Laughs. 82 minutes. 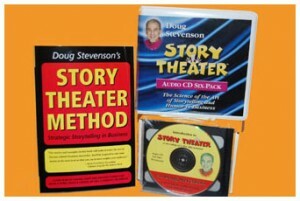 This 2 CD set is a recording of a live Tele-Seminar on The Story Theater Method. It is a great overview of Story Theater, The Nine Steps of Story Structure, how to choose your stories, and more. 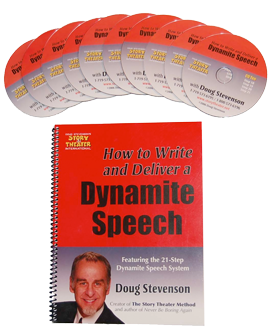 In this program, you’ll learn 7 tips for selling your speeches, 5 strategies for selling yourself, the power of positioning, how to get speakers bureaus to notice you, where to find clients that will hire you, how to create an Imbroglio story and how to create product from your speeches. 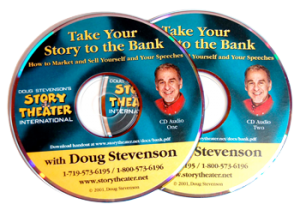 Harness the Power of Story to Engage Your Audience, Customers and Employees – This is an audio recording of Doug’s June 22, 2011 teleclass hosted by Michel Neray, of The Essential Message. Note: Upon purchasing this product you will be redirected to a download page. You will have 48 hours to complete your download of the mp3 file. 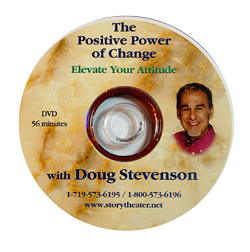 This video program features how to Elevate Your Attitude and master the change process. 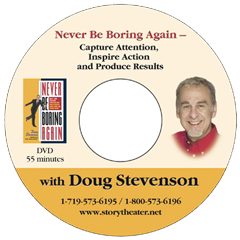 This is a 2004 video recording of Doug’s most requested keynote. It includes the Streaking Story and the Limo Story. The content is great and the keynote can be useful as an example of how to weave stories together in a keynote. This video lets you watch Doug in action and study physical humor and body language. 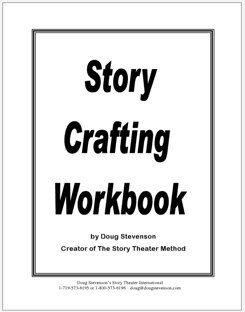 Use this extensive and thorough workbook to craft your stories using The Story Theater Method. Follow the formulas, answer the questions and fill in the templates and your stories will evolve from good to great. 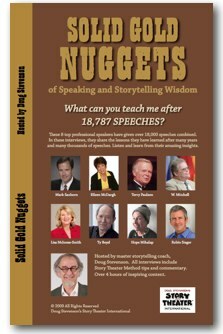 This comprehensive eWorkbook can be used over and over again with each new story you want to develop. 28 pages; pdf format. This 5-page article by Doug Stevenson covers benefits and problems with using PowerPoint in a presentation. 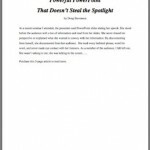 Doug also lists 37 ideas to help you use PowerPoint in such a way that YOU remain in the spotlight.